“Sport is the best.” That’s what a teenage boy wrote in Cecilia’s class at Boxes of Chocolates in response to English Raven’s Wandrous Whiteboard Challenge. Shelly at her Teacher Reboot Camp, Mike Harrison, David, where he offers his Reflections of a Teacher and Learner, and Emma Herrod have some great stories and illuminating photos of their boards too, while at Sabrina’s Weblog, we get to hear about her lesson that involved extensive boardwork. The challenge gets you to unplug your teaching and see the whiteboard both as a way of scaffolding learning, and as a product in its own right. The challenge fits in nicely with two other recent posts, by Andrew at Idle EFL Thoughts and Ceri in Close up. Both describe wonderful spontaneous lessons based around just one word, lessons made possible by having a sophisticated understanding of language, what it is and how it works, all the different aspects that one can draw on and pass on using a myriad of activities from the TEFL pool. Nick takes this a step further in Turklish TEFL, outlining things to consider when putting together your own curriculum. I’m imaging the lesson, what could very well happen and probably has in one of my classes. I’m imagining the learner, a teenage boy, sporty and friendly, with a ready smile. He’s wearing a T-shirt and long baggy shorts. I like him. I think he’d prefer, at a push, to be actually playing sport rather than just talking about it, but he finds it an acceptable compromise. I read out what he’s written. He lets slip a slight snigger. I can’t imagine him having ever heard this in English, but I assume he’ll understand. There’s some eye contact. It’s his lack of words rather than desire that is hindering his communication. “Is it better than…what other subjects are there?”. I open it up for others. We get “astronomy” and “science” amongst others and look at their roots. 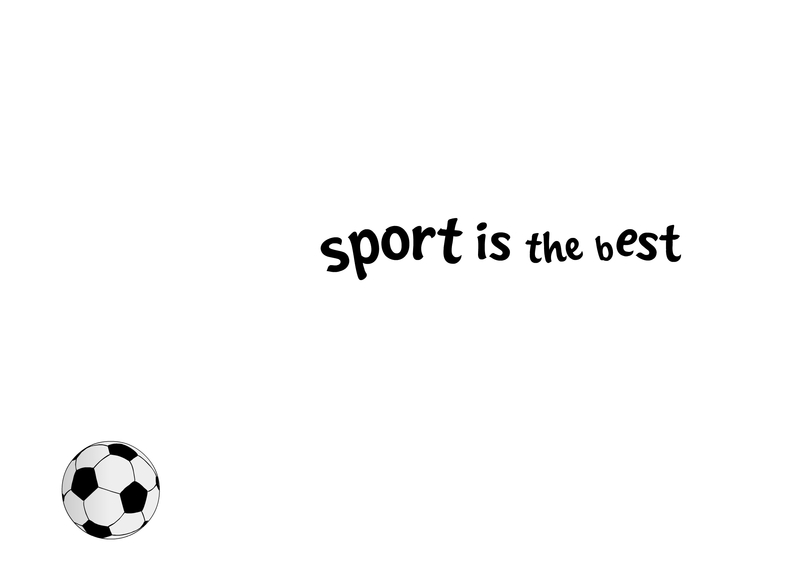 We continue with the theme and he offers an alternative: “Sport is the greatest.” I write it down. Interesting. Both “best” and “greatest” end in “est”. Although we always think of “best” as irregular, it’s only the beginning, not the end, I realise. Worth showing. I need a tissue to clean the board. I’m a guest teacher and I forgot the board rubber. I get offered three. None of the boys has one. Sport is indeed his life. It’s what he lives for. It’s what he’d die for! “I would die for it,” he learns to say. There are lots of affordances, as Willy outlines in Authentic Teaching, chances for error-strewn language practice, errors which I let pass or occasionally reformulate for them to repeat if they choose to. “When you’re not playing sport, you’re talking about it. 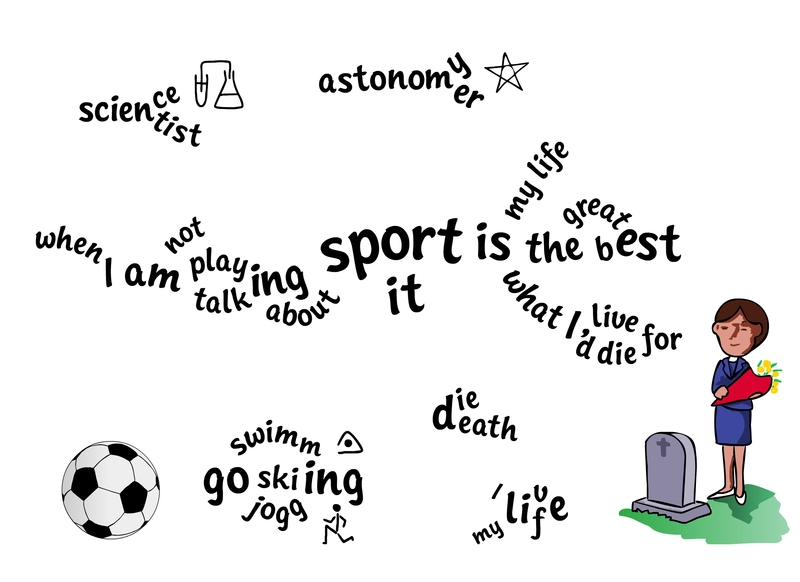 We practise those sentences, and mix them around, trying different combinations of “sport” and “it”. Nick Ellis says: “language must be scrutinised, manipulated, personalised and practised”. Using the language plant that’s been growing on the board as a visual reference, I think we’re squeezing in quite a few of these verbs. Henrick has been Doing Some Thinking about how a beginner guitar player will model the hand positions of an expert guitarist. Learning by watching. It is a tenet of NLP, and it’s what I have planned. I stand up, raise a finger and work towards my dramatic crescendo, referring to the board throughout. My hand is clasped to my heart. “Your go.” I say to him. He’s reluctant at first, but gets into it. Others have a go too, all versions slightly different, and there’s much laughter. It’s another learners’ turn now, a teenage girl, the tissue giver in fact. “I need music in my life – all the time.” She writes. By the way, how do you make those neat board images?? What a great post! I really enjoy your writing style. It is great the way the students connect to the language and personalize it. Another great point about your lesson is that the students get to know a little about each other. In my experience, this helps build community. Hi Shelly, thanks for your lovely comments. Yes, your post mentions group bonding, doesn’t it. We’re both describing collaborative activities here. Competition can be healthy, but I prefer it when everyone’s pulling in one direction. Hi Cecilia! Was he wearing shorts and T-shirt? Thank you for the comments, I chose your board because it portrayed a wide variety of language and learners. I think Jason’s activity really allows the composition of your class to shine through. And as I mentioned to Shelly, taking a photo is a nice way to keep the memory. I love the way your board looks. I think design and layout is often overlooked in board work. One of my mentors in the early stage of my career told me that at the end of the lesson/stage of the lesson, you should be able to stand back from the board and see something coherent. Your way of ‘planting’ and ‘branching’ achieves this very well. Thank you very much David, and I agree with the point your tutor made to you about the board. Some pieces of advice are invaluable, don’t you think? I’ve just found your website through (via the wonderful Darren Elliott’s Lives of Teachers blog)- and what a find! I love the word plants you have made here. In my last lot of tutorials nearly all of my students identified themselves as visual learners (which surprised me a bit)so I really do need to try this out in class. In response to your reply to Mike, are you saying that when we writing in a non-linear/ curvy way on the interactive whiteboard, we can end up with something as beautiful as your images? I feel as though I must be missing a stage or two. Will definitely try it out next week (we’re on half term here) but in the meantime, if you have any more tips, they’d be v gratefully received! Hi Angela, I’m on half term too, hope you’re enjoying it 🙂 Thank you for your very kind comments, I’ll write a nice post dedicated to you and the others who have asked how to make a plant. In the meantime, look at one of the autumn trees outside, one where you can see the branches. Imagine these branches being composed of words, so you can read your way along a branch. Now start reading it again, but at some point divert off down another branch. If you change just the last word, it’ll look like two little twigs. If you change early in the sentence, it’ll be like your tree has got two big boughs. Hope this helps! You’re right though, there are more stages, or at least more handy tips to give. Ah, I didn’t express myself v clearly- what I meant was, is there a way to do this on the interactive whiteboard (ending up with the beautiful wavy branches, pictures etc)? Is there a feature on Smart Notebook which allows us to convert our writing to curved text which I don’t know about? – i.e. so that we can create something along the lines of your final images, but in the classroom, as we go along? (rather than just drawing a mind map) ? Or is this something that necessarily comes after class, with some tidying up, on the computer? There isn’t anything to my knowledge. That’s in fact what I’m working on, and I’m very glad you’re interested, Angela. You are currently reading Sport is… at language garden.